WO1 (RSM) Dawe joined the Corps in August 1979. On completion of recruit training he was drafted to 40 Commando Royal Marines in Plymouth, where he served for two years before joining Royal Marines Stonehouse in 1982. He joined Air Defence Troop in 1983 where he remained for the next 4 years completing several operational tours to the Persian Gulf and exercises in Norway, Germany and Denmark. During this period he successfully completed his Junior Command Course and was promoted to Corporal in 1986. In 1987 he returned to 40 Commando Royal Marines as a rifle section commander deploying on several exercises including jungle training in Brunei and an operational tour of duty to South Armagh, Northern Ireland. He remained in 40 Commando Royal Marines for 3 years and completed his Platoon Weapons Instructors Course. After a period at CTCRM he successfully completed his Senior Command Course and was drafted to 42 Commando Royal Marines as a troop sergeant in Kilo Company, he saw another tour of duty to Northern Ireland, this time as a multiple commander and conducted exercises in the Mediterranean. After successfully completing his PW1s course at the end of 1992 he returned to 42 Commando Royal Marines for a short period, leaving in the Easter of 1993, to take up the position of chief instructor for the Royal Marines Sniper Training Team, having become a marksman during his sniper course. During this period he attended an Advanced Scout Sniper Course with the United States Marine Corps (USMC) in Virginia USA. In 1995 he returned to the USMC for a two-year tour of duty as a weapons instructor located at the Small Arms Weapons Instructor School, Quantico, Virginia. During his time in America he taught USMC weapons instructors how to plan and conduct weapon-training lessons, culminating in live firing range packages. He also assisted the Scout Sniper School in training USMC snipers. On returning to the UK he was promoted to Colour Sergeant and employed as the team leader to Young Officer Training at CTCRM. In 1999 he successfully completed his Advanced Command Course and on completion was promoted to Warrant Officer 2nd Class. On promotion, he was drafted to Mike Company 42 Commando Royal Marines as the Company Sergeant Major and during the next 2 years he completed 2 Amphibious Ready Group deployments both of which deployed operationally to Sierra Leone, along with exercises in France, Turkey and Norway. 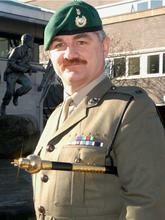 In 2001 he returned to CTCRM and assumed the duties of the Advanced Command Course Sergeant Major. On successful completion of the RSM board he was appointed as the RSM of United Kingdom Landing Force Command Support Group. As the RSM of UKLF CSG he deployed on Operation Telic to Iraq in 2003. He also completed several exercises to Norway and America. In November 2004 he was appointed as the first Brigade Regimental Sergeant Major. During this period the Brigade deployed on several exercises and to Afghanistan. He was selected to the prestigious position of Corps Regimental Sergeant Major and took post in February 2007. He lives in Plymouth with wife Angela and two sons James and Jonathon. He enjoys most sports particularly rugby for which he coach's a local youth team.